Chronic Obstructive Pulmonary Disease is a disease of the lungs, also known as broken wind, heaves or COPD. The disease is usually considered to be an allergic phenomenon resulting from sensitivity to inhaled particles such as dust, pollen, fungi, spores, etc. Originally, the terms broken wind and heaves were used by horsemen and veterinarians, but over a period of time, the descriptive term chronic obstructive pulmonary disease or COPD, which is also used in connection with the human ailment is being used in much of the literature related to equines. Initially the horse may have asthma-like symptoms, begin developing a chronic cough, wheeze during exercise and develop a shallow cough when feeding, with a resulting reduction in performance. As the inflammatory response to environmental dusts or other causative factors such as bacterial, parasitic and viral infections develops, it leads to a narrowing of the airways within the lungs. The small airways of the lungs narrow as the smooth muscles surrounding the lung tissues begin to constrict. Although air appears to be able to enter the lungs normally, the usual elastic recoil of the lungs is not powerful enough to push the air out again past the obstructions in the passage ways. As a result, the horse has to push forcefully with the muscles of the thorax and abdomen in order to empty the lungs. Historically, this muscular effort gave rise to the name heaves. Over a period of time the muscles may become over-developed and it is possible to see a 'heave line' between the muscles along the lower belly. Although no definitive cause for COPD has been determined and there continues to be some dispute about the kind of hypersensitivity that causes the disease, the biggest culprit in the development of chronic obstructive pulmonary disease appears to be poor-quality hay. If hay is poorly cured or old, dust and mold are released which the horse inhales, and over a period of time, the dust and/or mold can create an inflammation in the air passage ways. Poor quality grains may also have mold spores and dust that the horse inhales during the eating process. Dusts and molds in bedding, pollens, dust and other irritants in the environment are also contributory causes of COPD. Typically, a horse that has been in remission and is again exposed to dusty or moldy feeds or surroundings has a reaction within about 90 minutes, indicating that once the lung tissues are affected, the damage and sensitivity are ongoing, even during periods of remission. 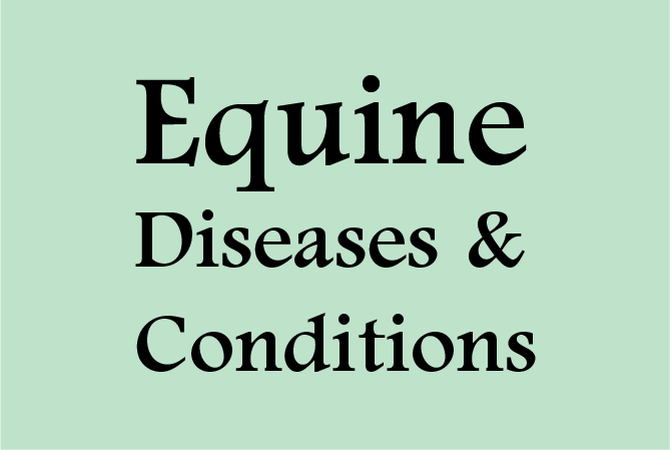 The disease is rare in warm, dry climates and in areas where horses spend little time in stables. Most published evidence supports the theory that the disease is an allergic response that follows exposure to dust and molds. Other causes include toxins from the intestinal tract, viral infections, exposure to cold air and genetic predisposition, although evidence to support these theories is lacking. Lung worm infestations sometimes mimic COPD and should be ruled out before beginning treatment. Good stable and feeding practices can help avoid and control COPD. Make sure that any fodder and bedding is mold and dust free. Switching to pellets and alfalfa cubes will lower the dust content of the air. Always provide plenty of fresh air in a clean environment with good ventilation through the stable. It is better to use horse blankets or rugs than it is to completely close off the stable area during colder weather. Switching to shredded paper or rubber matting for bedding may help with the problem. .
Two phases are used in the treatment of COPD. Drugs called bronchodilators are used for immediate relief. Although they don't have any curative effects, these products allow the smooth muscles in the lung airways to relax, making breathing easier. . Some veterinarians may prescribe a face mask that is used to allow the horse to breathe in a mist of drugs from an inhaler. This face mask with the mist of drugs provides immediate relief and, although most horses don't like the face mask in the beginning, they learn to accept it because of the relief it provides. Bronchodilators are not recommended for long-term use. Corticosteroids are usually used for maintenance treatment. It often takes several days or weeks for the steroidal anti-inflammatory drugs to take effect and the results will vary from horse to horse. If the cause of COPD is allergies, treatment will be highly individualistic which means that a veterinarian will need to run tests to determine what the allergens are, the exact type of drug, dosage, method of administration and dose frequency. Some veterinarians suggest using supplements that help curb the production of histamines in the tissues. Antioxidant vitamins A, C, and E can be given under a veterinarian's direction to help combat free radical damage produced during stress response and to promote tissue repair. While the irritants and allergens cannot be eliminated completely from the horses' environment, knowing what to avoid can help a great deal. Good management of the stable and pasture areas, a reduction of dust, mold, and other environmental irritants can either mitigate the development of COPD or help prevent it.